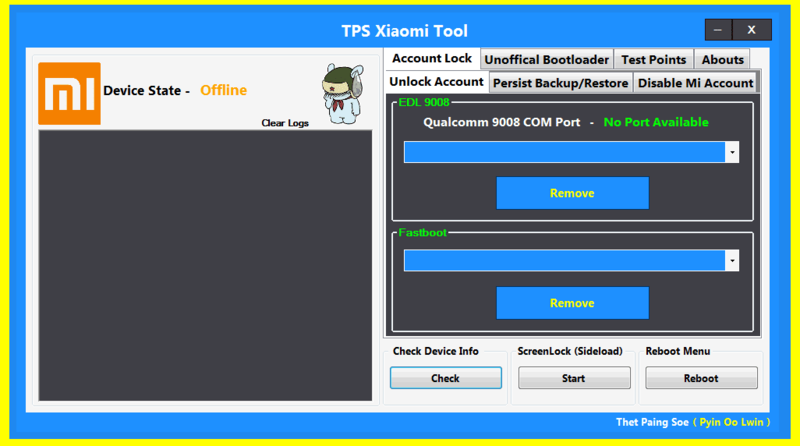 Xiaomi MI Account Remover Tool working For Xiaomi MI account bypass, Bootloader Unlock find test Point .Download TPS Xiaomi Tool full Free And Paid version. This Tool Easy to bypass mi cloud Lock on xiaomi redmi. This is 100% Perfect Xiaomi devices service tool . # Xiaomi MI Account Quick Unlock on EDL 9008. # Fastboot Remove From Some Smartphone Or Xiaomi Model. # Devices Info Check Xiaomi Smartphone. # Quick Control Menu and more Feature.